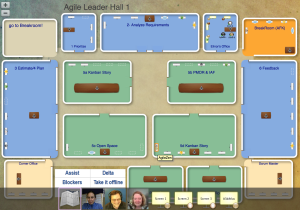 Last week, I had the pleasure of attending a conference in a virtual world with AgileBill Krebs. We started by meeting in a virtual office in Sococo and then we headed over to Second Life to attend part of the Virtual Worlds: Best Practices in Education (VWBPE) conference. I loved Sococo! It was surprisingly easy to use and the functionality is great. It’s different than Hangouts or Sqwiggle in that you see things spatially… from a floor plan perspective – but with video and screensharing functionality! Each of the squares represents a room. You can see where everyone is in the floor plan (and you can move from room to room) but you can only hear and speak to those who are in the same room with you. 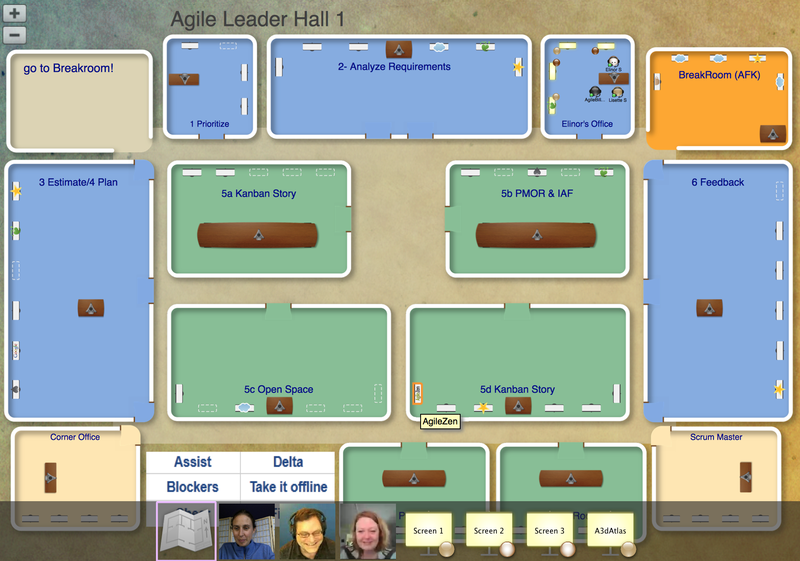 In the image, you can see that AgileBill and I are all meeting in the top right room. I will definitely be hosting remote working sessions in Sococo in the future – stay tuned! 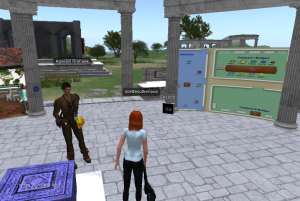 After we had said our hellos and played with all the functionality in Sococo, we moved over to Second Life, which I found immediately frustrating. The login process is cumbersome and it’s not obvious what one should do after logging in. After choosing my avatar, I was spit out onto a beach somewhere (a “newbie beach” – ha!) where I stumbled around bumping into other newbies. Thankfully, AgileBill quickly rescued me. However annoying the login process might have been, I was completely surprised by how absolutely fabulous the virtual world experience was. AgileBill first took me to his “Dojo” where he taught me how to walk around, sit down, and interact with objects. 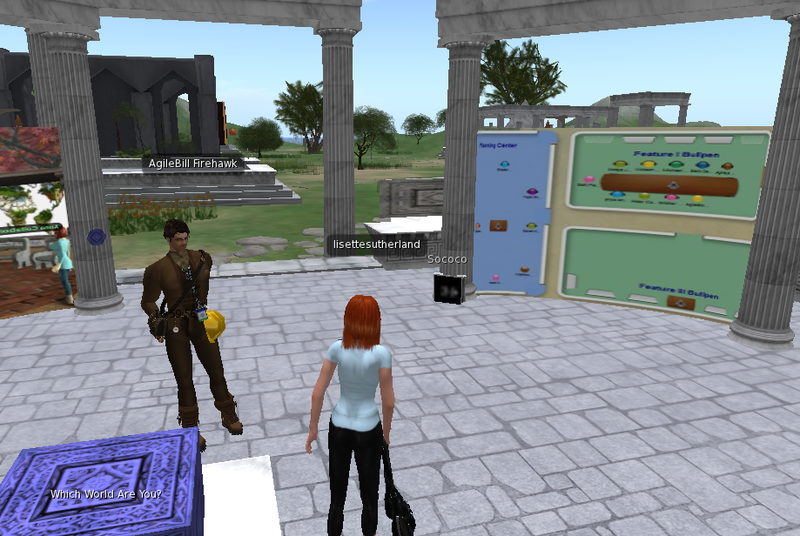 We then teleported over to the VWBPE conference where we toured a couple of the exhibits. We went to a court room where people can practice what it’s like to sit in the witness stand – or to be a court reporter. Immediately one can see the uses for medical training, emergency response, or, of course, military simulations. After all the touring, we decided to sit down around a fire, relax and have a different kind of meeting – with a cup of virtual hot chocolate (with marshmallows)! While I was sitting with AgileBill around the fire, another woman wandered into the exhibit to look at the posters. AgileBill got up and spoke with her and gave her additional information. Instant networking! Because you can see what people are doing and people can see what you are doing, you can’t just sit back and watch. You are forced to engage. In an online meeting (without video), you don’t know if your colleagues are paying attention or not. Second Life definitely has a learning curve. It’s very helpful to have a Sherpa like AgileBill take you on a tour when you first start. There’s also tons of stimulation. The colors and the amount of interaction can be very draining. Virtual worlds may seem overly techie and nerdy to some, but they are undeniably powerful learning tools and certainly worth exploring. 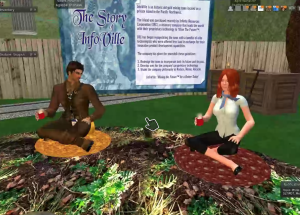 I highly recommend contacting AgileBill Krebs if you’re interested in anything virtual worlds related!